URSARU, O., AGHION, C., LUCANU, M., TIGAERU, L.
No relevant keywords could be extracted from the references. This paper deals with a novel pulse width modulation (PWM) switching strategy for a voltage source inverter through carrier modification. The proposed discontinuous sine carrier PWM (DPWM1) method, which uses two modified sine waves, has a better spectral quality and a higher fundamental component. This improved waveform has been derived from the original sine PWM technique through the addition of the 17-percent third-harmonic component to the original sine reference. S. R. Bowes, P. R. Clark, "Transputer-Based Harmonic-Elimination PWM Control of Inverter Drivers", IEEE Trans. on IAS, vol.28, No.2, pp. 72-80, 1992. 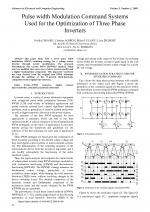 S. R. Bowes, P. R. Clark, "Simple Miroprocessor Implementation of New Regular-Sampled Harmonic Elimination PWM Tehniques", IEEE Trans. on IAS, vol.28, No.1, pp. 89-95, 1992. P. G. Handley, J. T. Boys, "Practical Real-time PMW Modulators", Electric Power Applications, IEE Proceedings B, vol. 139, no. 2, pp. 96-102, March 1992. J. Holtz, W. Lotzkat, Khambadkone A., "On Continouse Control of PWM Inverters In the Overmodulation Range Including the Six-Step Mode", IECON 18th Ann. Conf. IEEE Ind. Elect. Doc., San Diego/Ca, pp. 307-312, 1992. A. M. Hava, R. J. Kerkeman, and T. A. Lipo., "A High Performance Generalized Discontinous PWM Algorithm", IEEE-APEC Conf. Records, pp. 886-894, Atlanta, Giorgia, 1997. A. M. Hava, R. J. Kerkeman, and T. A. Lipo., "Simple Analytical and Graphical Tools For Carrieri Based PWM Methods", IEEE-PESC Conf. Records, pp. 1462-1471, St. Louis, Missouri, 1997. A. M. Hava, R. J. Kerkeman, and T. A. Lipo., "Dynamic Overmodulation Characteristics Of Triangle Intersection PWM Methods", IEEE Industrial Application Soc. Conf. Records, pp. 1520-1528, New Orleans, Louisiana, 1997. S. Jeevananthan, R. Nandhakumar, P. Dananjayan, "Invertid Sine Carrier for Fundamentak Fortification in PWM Inverters and FPGA Based Implementation", Serbian Journal of Electrical Engineering, vol.4, no.2, pp. 171-187, November 2007. B. Justus Rabi, "Minimization of Harmonics in PWM Inverters Based on Genetic Algorithms", Journal of Applied Sciences 6(9), 2056-2059, ISSN 1812-5654, 2006. V. Maier, S. G. Pavel, C. D. Maier, I. Birou, "Conect Application of the Discrete Fourier Transform in Harmonics", Advances in Electrical and Computer Engineering, vol. 8, no. 1, pp. 26-31, 2008. *** 80C51Family Architecture, Philips Semiconductors, Sunnyvale, California, U.S.A, March 1995. *** 80C51Family Derivatives, 8XC552/562 overviewe, Philips Semiconductors, Sunnyvale, California, U.S.A, August 1996. 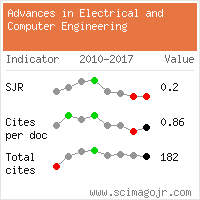 Citations for references updated on 2019-04-22 23:06 in 46 seconds. Website conception, design and maintenance by Eugen COCA. Content updated on 28 Feb 2019. Site engine updated on 28 Feb 2019. This page was generated on the server in 0.077 seconds and loaded in your browser in > seconds.